Yay! I’m travelling through South Africa, FINALLY. For all those who work and live in the Southern African region, South Africa, or the Republic of South Africa (RSA) as it is officially called, is the inevitable pit stop for our international flights, our business partner for professional dealings, venue for our conferences and workshops, the end of the road for shopping, and the place we go to, to chill. But ask us if we have really travelled to it, and you’ll get a big blank “nope.” Which is an absolute pity. People come from far and wide to discover this beautiful country. Every year, I myself pack my bags and travel to some distant exotic locale thousands of miles away. And yet, right in front of my doorstep is a country so familiar, so beautiful, and one I know so little of. Prester John Memorial: It was the Portuguese explorers’ quest to rope in the mythical king-priest Prester John as a Christian ally which led them to sailing around Africa. The memorial is believed to be the only monument in the world depicting Prester John. My journey starts in Port Elizabeth or PE, one of the lesser visited cities in South Africa that is often reduced to a mere starting or ending point of the Garden Route. It is sad, since like every other city in this country, Port Elizabeth too is a treasure trove brimming with beauty and history. The city today forms part of the Nelson Mandela Bay named after “Madiba,” democratic South Africa’s first president and an international icon, who was born and spent his childhood years in this area. 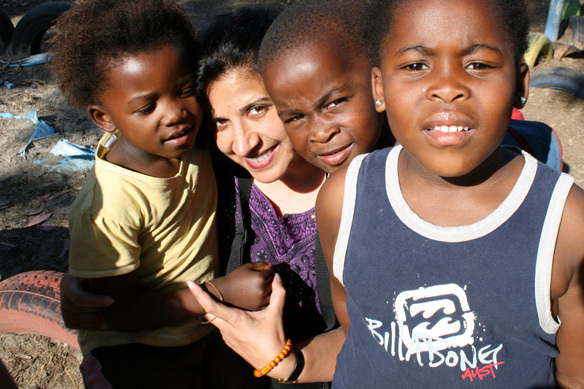 Port Elizabeth’s historical claim to fame is that it was here that the Khoisan, British, Dutch, German, and Xhosa people first came face-to-face with each other. 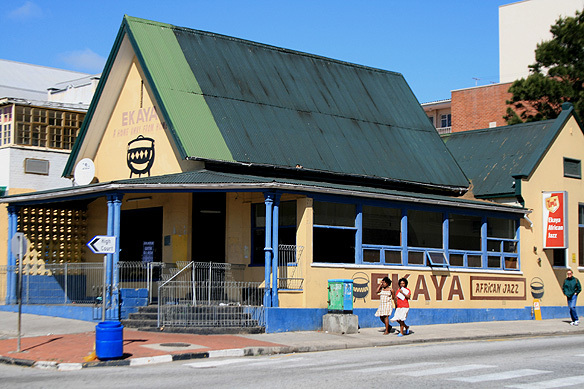 The port is also famous for being the landing place of the 1820 Settlers from Britain which led to some of the finest Victorian architectural masterpieces ever being built in Africa, many of which are still intact in the heart of the city today. The 1820 Settlers was a premeditated strategy on the British part to create a buffer zone between the expanding Boer nation and the indigenous Xhosa people in the region. 4,000 English immigrants were given free passage and land along the coast, to fight against the Xhosas and break their resistance against the European encroachment. The Xhosa people currently form the second largest African grouping in the country after the Zulus; their language characterized by the clicking sounds which they borrowed from the earlier San people. It was nice to walk around central PE on a Sunday—a small pocket of England replete with neo-gothic edifices and churches topped with soaring spires, and that too completely devoid of any traffic. 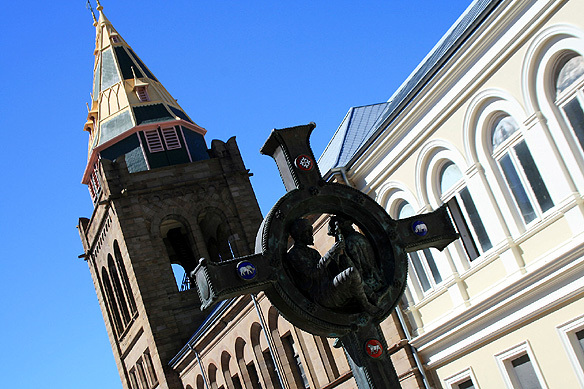 On one side of Market Square stands the imposing City Hall built between 1858 and 1883 with its striking clock tower. On the other is the Main Library, an excellent example of the Victorian Gothic style. Its terracotta facade was made in England and rebuilt on the current site. A statue of Queen Victoria, carved out of Sicilian Marble in 1903, stands in front of it. A short distance away is the stone Fort Frederick built in 1799 by the British forces as a defence against the possible landing of French troops. Interestingly, no shot was ever fired from this fort. The Campanile by the harbour reminded me of Italy. 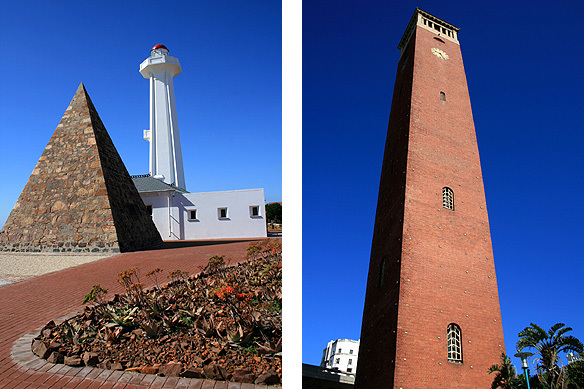 The 53.5 metre tower was erected to commemorate the landing of the 1820 Settlers. Some days are just plain nice. I popped into both the Roman Catholic and Anglican churches in the Square where I found myself dragged into the services and then hugged with the words “May God be with you.” A terrifying climb up narrow wooden ladders inside the Donkin Lighthouse showed me stunning views. No. 7 Castle Hill, built in 1829 and one of the oldest surviving settler dwellings, recreated simple Victorian domestic bliss. Fort Frederick (c. 1799) and the cannons that were never used. 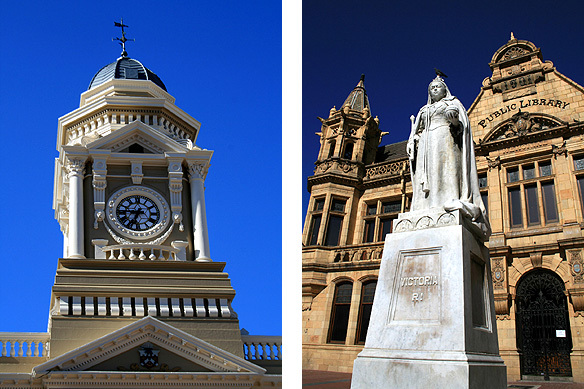 Victorian Port Elizabeth: The beautiful clock tower of City Hall (c. 1858); imposing Main Library with Queen Victoria’s statue; charming Donkin Lighthouse and Pyramid; the towering Campanile commemorating the landing of the 1820 Settlers. 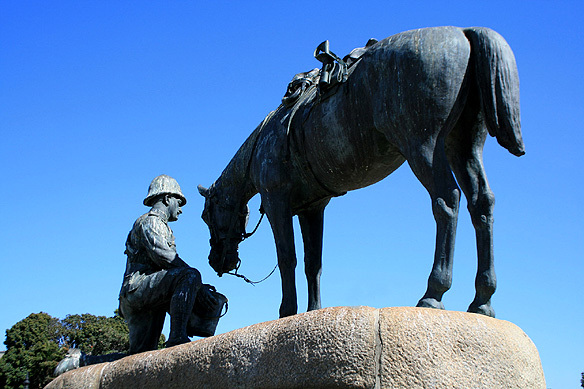 This I found really quaint … The Horse Memorial is dedicated to all the horses that died during the South African War (1899-1902). Changing times: A turn-of-the-Century church, now converted into an Afro-Jazz bar. 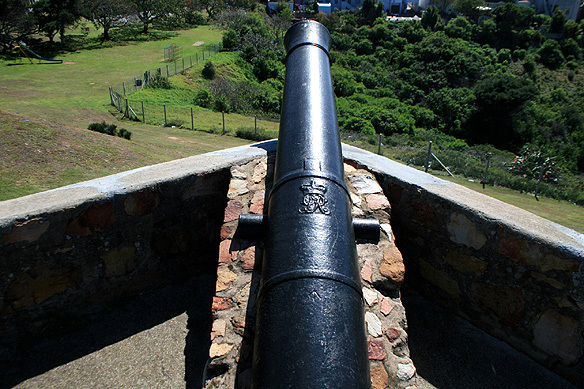 Port Elizabeth, however, is not just history. It has one of the most spectacular stadiums built for the FIFA games, shaped like a white lotus on the shores of its North End Lake. Right in the middle of the city is Settlers Park, a 80-hectare nature reserve with around 140 species of birds and great for a couple of hours hiking. The miles of pristine beaches are accredited Blue Flag Beaches meeting “international standards of excellence in the areas of safety, cleanliness, amenities and environmental standards,” in addition to being absolutely stunning. So if you’re a water sports buff, this is the place to be. As the sun melted in the cloudless skies, I walked on the promenade—the vivid inky blue ocean waters crashing on the soft white sands to my left, a wild wind whipping my solitary walk, a kind of warm happy feeling inside. 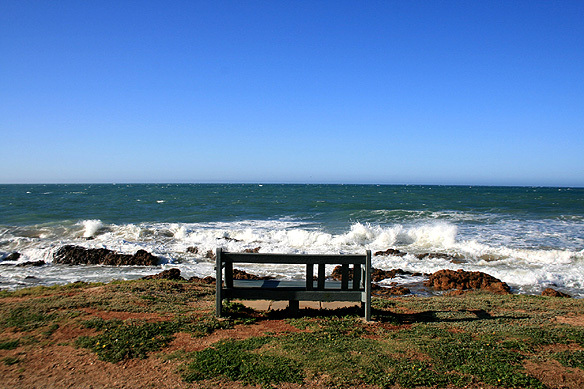 I was glad I had stopped and taken the time to explore Port Elizabeth. These last two days boded well for my journey ahead. Don’t you agree? 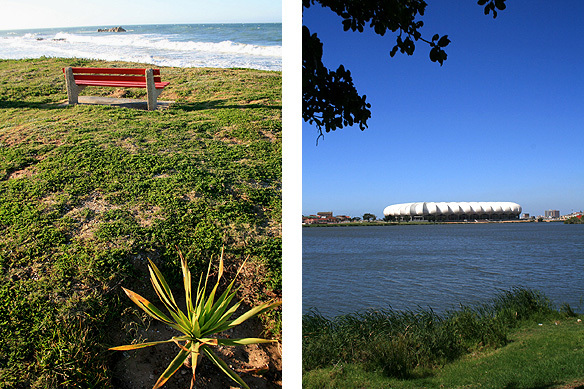 PE’s other attractions—Blue Flag Beaches flanking the promenade; Nelson Mandela Stadium on the shores of North End Lake; indigenous forest in Settlers Park Nature Reserve. This entry was posted in Exploring our World, South Africa and tagged 1820 Settlers, Adventure Travel, Blue Flag Beaches, Donkin Lighthouse, FIFA, Fort Frederick, Garden Route, Madiba, Nelson Mandela, Nelson Mandela Bay, PE, Port Elizabeth, Prester John, Settlers Park Nature Reserve, South Africa, South African Tourism, The Horse Memorial, Things to do in South Africa, Victorian England, Water Sports by Rama Arya. Bookmark the permalink. It’s amazing journey I think. I like old city like that.